For our February event, Genne Murphy will be returning! 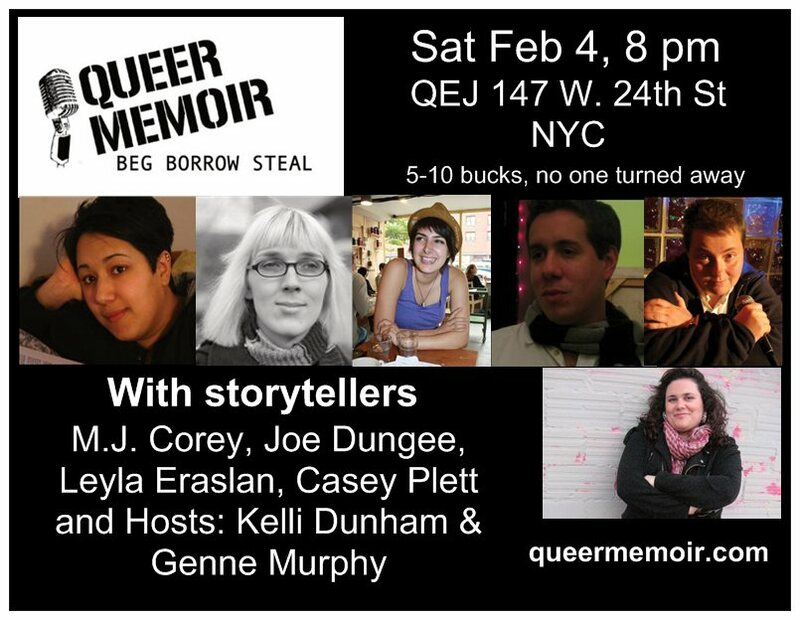 Queer Memoir is New York’s only queer storytelling event. Let us know how many chairs to put out; RSVP on facebook. M.J. COREY – Born in California, M.J. Corey grew up all over the country and ended up in New York City to attend Sarah Lawrence College. She writes about New York City, feminism, lesbian life, and rock music. Her creative non-fiction has been seen in The Brooklyn Rail, Killing the Buddha, and Shelf Life Magazine. Other work is published in Make/Shift Magazine, Tom Tom Magazine, Bend Over Magazine, Seventeen Magazine, Freshly Hatched, VelvetPark, The Sentimentalist, Autostraddle and guestofaguest.com. In addition to writing, M.J. conducts oral history interviews, promotes parties in the city and curates art shows. JOE DUNGEE is a resident of Philadelphia, where he currently serves as the Business Manager for Equality Pennsylvania, a statewide LGBTQ rights group dedicated to achieving equality for queer Pennsylvanians through coalition-building, education, organizing and policy reform. Joe recently earned an Associate’s Degree in Liberal Arts from the Community College of Philadelphia and plans to go on to earn a BA at Temple University. LEYLA ERASLAN Leyla Eraslan owes her unrepentant weirdness to a South Jersey upbringing and reading too many books. Her writing has been featured in City Paper, the Fringe Festival, PDC’s Primary Stages, Apiary Magazine, and more. She has performed as an actress and storyteller in the Five Minute Follies, Queer Memoir, and The Philadelphia Queer Literary Festival to name a few. She’s involved in a smattering of other artistic endeavors, and enjoys the word ’smattering’. Leyla’s passions include art, helping people, and drawing lips in the corners of her notebook. CASEY PLETT is a former columnist for McSweeney’s Internet Tendency, and has also been published in Line Zero, Cavalier Literary Couture, and Anomalous Press. She is a student and teacher at Columbia University, and when not living the uptown life she works at the Strand, where she helps you get books off the top shelf. KELLI DUNHAM is a ex-nun, genderqueerious stand-up nerd comic and author of four books of humorous non-fiction, including two children’s books being used by Sonlight conservative home schooling association in their science curriculum. She has appeared on Showtime, the Discovery Channel and was once asked to emcee a livestock auction. Her website is kellidunham.com. 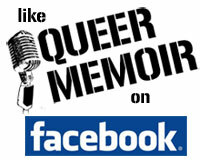 She is the co-founder, with Genne Murphy, of Queer Memoir. Her hilarious new family-secret revealing show, Normal at Nite: Good Times & Family Matters with Perfect Strangers (a collaboration with R Eric Thomas) is debuting February 18th at NYC’s Stonewall Inn. GENNE MURPHY is a Philadelphia native, playwright and arts educator. Her work has appeared on Philadelphia stages and radio. Check out the upcoming production of her play, HOPE STREET AND OTHER LONELY PLACES with Azuka Theatre March 15-April 1: http://azukatheatre.org/show.php?prod=42. Genne is the co-producer, with Kelli Dunham, of Queer Memoir (queermemoir.com).